"Survey Finds Action on Information Requests Can Take Years"
"Study: Stalled FOIA Requests Date Back to Reagan Era"
"Drastic" Change or "More Thunder Than Lightning"? Washington, D.C., July 2, 2007 - The oldest Freedom of Information Act (FOIA) requests still pending in the federal government were first filed two decades ago, during the Reagan presidency, according to the Knight Open Government Survey released today by the National Security Archive at George Washington University. "Forty years after the law went into effect, we're seeing twenty years of delay," said Tom Blanton, the Archive's director, noting the July 4, 1967 implementation date for FOIA. "Sunlight is the best disinfectant, but this kind of inexcusable delay by federal agencies just keeps us in the dark." 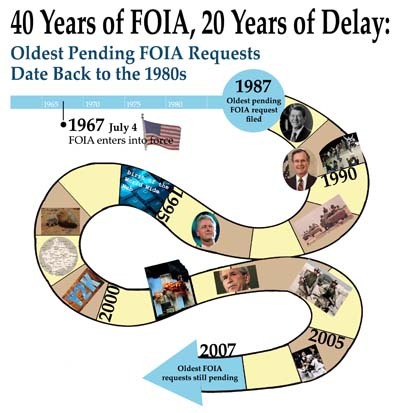 In January 2007, the Archive filed FOIA requests with the 87 leading federal agencies and components for copies of their "ten oldest open or pending" FOIA requests. The Department of State, responding to an Archive "ten oldest" request for the first time, reported ten pending requests older than 15 years--the majority of the oldest requests in the entire federal government. Other agencies with the oldest requests include the Air Force, CIA, and two components of the Justice Department, the Criminal Division and the FBI. "A lot can happen in 20 years. The Internet grew to adulthood in less time than it has taken our federal government to deal with these outstanding Freedom of Information requests," said Eric Newton, vice president of the journalism program at the John S. and James L. Knight Foundation, which supports the Archive's FOIA audits. "Americans once said they had the best open government laws in the world. Is that still true?" The Knight Open Government Survey also identifies ten federal agencies that misrepresented their FOIA backlogs to Congress. For example, the Justice Department's Office of Information and Privacy--which is leading the opposition to current FOIA reform legislation passed by the U.S. House and pending in the Senate--claimed in its most recent report to Congress that its oldest request was from 2002, but provided the Archive with a package of oldest requests dating back to 2001. CLARIFICATION: The Department of Justice's Office of Information and Privacy (OIP) has informed the Archive that the October 22, 2001 request reported as OIP's oldest was first received by the DOJ-OIP on February 5, 2002. OIP indicated that the request was not delayed by intra-agency routing, but likely was delayed as a result of the Anthrax mail screening program that took place in 2001-2002. Because agencies calculate their response time from the date of receipt of the request, OIP's report to Congress listing its oldest pending request as dating from February 5, 2002 is not inaccurate. "It is remarkable to see data showing that agencies are not able to accurately answer Congress's questions about their backlogs, and at the same time hear that the Department of Justice is objecting to a law that would require agencies to assign tracking numbers to FOIA requests," commented the Archive's General Counsel Meredith Fuchs, referring to the DOJ's objections to the pending OPEN Government Act (S. 849). The Archive's new Survey also showed several agencies contradicting their own responses to the Archive's two previous "ten oldest" audits. These agencies coughed up requests in 2007 that were significantly older than the requests they produced in 2003 or 2005. Ms. Fuchs noted, "We have been receiving letters from agencies asking us whether we are willing to abandon our long-pending requests, and the Treasury Department actually admitted that it had destroyed several of our FOIA requests several years ago despite the fact that Treasury had never responded to the requests." Bipartisan Congressional efforts to solve some of the problems exposed in the Archive's "ten oldest" audits have stalled in the Senate, with Republican Senator Jon Kyl of Arizona personally holding S. 849 from an up-or-down vote. The bill would impose penalties for agency delay, mandate accurate and timely tracking and reporting of FOIA requests, and give FOIA requesters new tools to hold agencies accountable, including reimbursing attorneys' fees when agencies play litigation games against requesters. The House passed its Freedom of Information Act Amendments of 2007 with a significant bipartisan majority. The Emmy- and George Polk Award-winning National Security Archive at the George Washington University has carried out five government-wide audits of FOIA performance over the last five years. All of the Archive's reports are available online at www.nsarchive.org. The John S. and James L. Knight Foundation promotes journalism excellence worldwide and invests in the vitality of the U.S. communities where the Knight brothers owned newspapers. Since 1950 the foundation has granted nearly $300 million to advance journalism quality and the freedom of expression.